Nathaniel North (1671 - 171?) 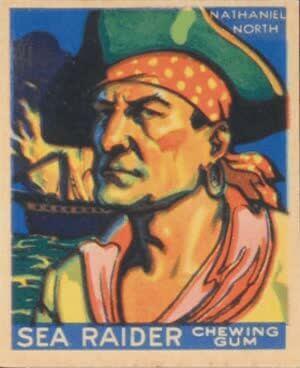 was a famous pirate from Bermuda that sailed on the first Pirate Round in the Indian Ocean along with John Bowen. When Bowen died of an intestinal disease, North would assume captaincy of the Defiant. North was famous for running a pirate republic at Ambonaivo and was a very successful pirate in his own right. During the Nine Years War North was part of a crew on an English privateering ship that attacked French shipping lanes. He was eventually pressed into the Royal Navy and found himself in British Jamaica. While there he once again encountered the ruthless British press gangs but escaped by jumping overboard and swimming to shore. By 1696, North was once again part of a privateer crew that seized a 18-gun brigantine named the Pelican off the coast of Newfoundland. The privateer he was sailing with next obtained a Letter of Marque to attack French ships off the coast of West Africa but they instead decided to make the Pirate Round and attack the treasure laden ships of the East Indies and the Mughal Empire. Venturing to the pirate haven of Madagascar, they set out to search for ships in the Indian Ocean and Red Sea. After failing to find any prizes in the area the pirates began raiding villages on the Comoro Islands before returning back to Madagascar. While on Madagascar the crew of pirates turned privateers elected North to be the quartermaster and they soon set off to begin pirating once again. They joined the pirates Dirk Chivers and Robert Culliford as they captured the ship the Great Mohammed. However, North's crew on the Pelican was cheated out of their share because the other two claimed it had not taken part in the battle. Following this dispute the Pelican left the pirates and went on to capture three smaller ships in the area. They kept one of the ships and renamed it the Dolphin however, soon a hurricane damaged both of the ships and the pirates returned to Madagascar to divide the loot and salvage whatever they could. In the end each pirate received about £700 from the venture. In 1699 North would serve as quartermaster again under Samuel Inless who was in command of the smaller ship the Dolphin. The new pirate crew set off again and captured a large Danish ship whereupon they sailed to the Ile Saint-Marie to divide the treasure. Each pirate received about £ from this capture. However, soon four man-o-wars arrived and forced Inless and the crew to burn the Dolphin. The British offered a pardon to the pirates and many of them accepted it. However, some of the pirates decided not to trust the colonial authorities and they took off in the ships longboat to the pirate haven at Madagascar. By 1701 North and his pirates were raiding settlements on land and plundered villages in the Comoro Islands. He then looted villages on Ngazidja and captured the sultan of Mayotte. Ransoming the leader, North later returned to sea and pirated in the Indian Ocean until he joined the crew of John Halsey as his quartermaster. As a crewman aboard the brigantine named the Charles they captured two British ships one of which Halsey took as his personal flagship. North was given command of the Charles and the two headed towards Madagascar. North soon crashed the Charles on a reef and returned to Madagascar himself to live with the King of Maratan. In 1709 North returned to Ambonavoula where he traded with the island of Ile de France and Johanna. North would eventually be killed in a tribal conflict on the island and was murdered by enemy natives.